hen Daddy got home from Knoxville that week-end, his draft notice had come in the mail. He could have gotten deferred because he had already served three years in the Navy and we had five kids, but Pearl Harbor had been bombed in December and the whole world was at war and he felt that he had to do his part. Before Daddy left to re-enlist we finished putting the roof on the house and moved into it. The old Chevrolet was worn out anyway so we sold it and sold all the chickens we had for $1.00 each. He left for Mobile, Alabama where they decided that he didn’t need to go to boot camp because of previous service and they sent him to Pensacola Florida Naval Air Station. As soon as the United States declared war—really, two wars: one in Europe against Germany, and one in the Pacific against Japan—rationing offices were set up. Gasoline, tires, shoes, sugar, soaps, meats, and toothpaste were rationed. For awhile, if you took an empty tube you could get tooth paste and shaving cream, which also came in tubes. Daddy said that he wanted me to come to Pensacola as soon as he could find a house. School was shortened that year: dismissing in April instead of May, so I decided to visit Mama before moving to Pensacola. I rode the bus to Flintville and spent three weeks with Mama. Aunt Matt had moved in with Mama and Uncle Joe had moved in with his son. They were both senile by then. I had not told Daddy, but I was pregnant again and I was so sick that I couldn’t sleep. Aunt Matt couldn’t sleep either and we sat up all night and talked. Why didn’t I listen to her? She might have told a lot of interesting things. Daddy wrote that I should go home and get ready to move because he had found a house. They only had three four-bedroom houses on the base and with five kids we would have to have a four-bedroom house. They wouldn’t let us live in a smaller one on base, but he’d found a two room house with an outside toilet. He’d bought train tickets and sent them to me. He said that if I wasn’t on the the train by three o’clock June 3, 1943 that he was going A.W.O.L. and come to get us. I went home, packed some things to ship and two suitcases to take, and locked everything up. Pa Frasier took our stuff and me and the kids to the train station in Fort Payne, Alabama on June first. Fort Payne was a very small town, but when we got to the train station, there were hundreds of people there. They said that I could ship our stuff but they gave me the money back on the tickets: only military personnel could ride the train. Pa Frasier took us to the bus stop (there was no bus station) and we bought the tickets at twelve o’clock, noon. We waited. Buses came by, and most stopped, but they were all already over-loaded. We finally got on a crowded bus at five o’clock. Back then, buses did not have air conditioning or bath rooms! At Anniston we got bumped off the bus for military personnel and finally got on another bus at nine o’clock the next morning. I had not carried any food except crackers and candy because I thought I could buy food at the train stations along the way: and I thought that the trip would take about twenty-four hours. The five kids had whooping cough and Bill was very sick. And I was pregnant again and very sick! At six o’clock that night we got to Birmingham—about 100 miles from Fort Payne. And we had been traveling for twenty-six hours. None of the roads were paved. At Birmingham there was no food and no red-caps to help with luggage: just hundreds of people shoving and pushing. Buses stopped but we couldn’t get through the crowds to get on. At four o’clock in the morning, two black women helped me get the kids through the crowd and onto a bus. The black women took Carrie and Hoyt to the back seat and took care of them for me. It took great courage for the black women to help me for, at that time, black people didn’t dare to speak to white people, much less touch them. We got to Pensacola at four o’clock in the afternoon. The trip took forty-seven hours and we had had no food for two and a half days. We were all about dead! I had sent Daddy a couple of telegrams along the way so he was waiting for us. He was just about crazy with worry! The house that Daddy had rented was on Nine Mile Hill and we’d gone right past it. He couldn’t find a taxi that would go that far out because the few taxis there was ran twenty-four hours a day and took six or eight fares at a time. So there was no profit in taking one fare that far. There were city buses that went to Nine Mile Hill and we finally got on one at seven o’clock. Daddy had planned to buy groceries before we got there but he had to go out on a mission at sea and hadn’t had time. When we got off the bus to walk to the house, we found that all the grocery stores were closed on Wednesdays. It was too late and too far to go back to the base P.X. but the landlady came by to see if we’d gotten there O.K. and she went back to her house and brought milk, sugar, coffee, bread and corn flakes. 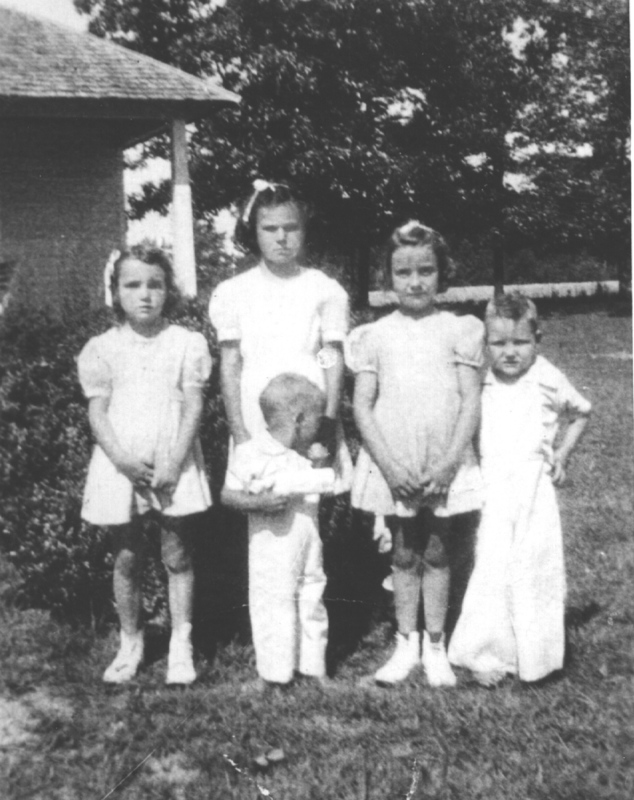 At this time Virginia was nine years old, Dot was seven, Carrie was six, Hoyt was four, and Bill was three. I was four months pregnant with John. In August we bought a 1934 A-Model Ford. We gave $300.00 for it. During the war, someone wrote a song about a dollar down and a dollar a week, so I guess they’d started having installment buying, but for most people at that time there was still no monthly payment plans. There was very little of anything to buy, anyway. We had extra rations of sugar and gasoline for we still owned the 20 acre farm in Alabama, and of-course you could get things at the P.X. that you couldn’t even get in the commissary—and the commissary had more than the regular stores. By now, no doctor would make house calls and if you were service people, living on or near the base, you had to go to military doctors. So John Richard was born in Pensacola Naval Hospital, October 15, 1943. John was known in the hospital as Big John -- 12 ½ pounds! All the Corpsmen fought over who was going to take care of him, and they took him to visit the patients in the Psychiatric ward. I stayed in the hospital for nine days and an ambulance took me and ‘Big John’ home. We moved from that house when John was three weeks old: into half of an old school house. Another family lived in the other half. The windows were at least ten feet tall and they were filthy. One day I got buckets, rags, and long handled mops and the kids and I washed the windows. While we worked, I saw a car stop and a man watched us from the back seat. That night he sent word for us to come and see him. He was crippled. He gave us coffee and said that he owned the school house and in two years with various tenants, no one had ever cleaned the windows. He said that he had a nice house and he wanted us to move into it. So we moved again, into the better house. 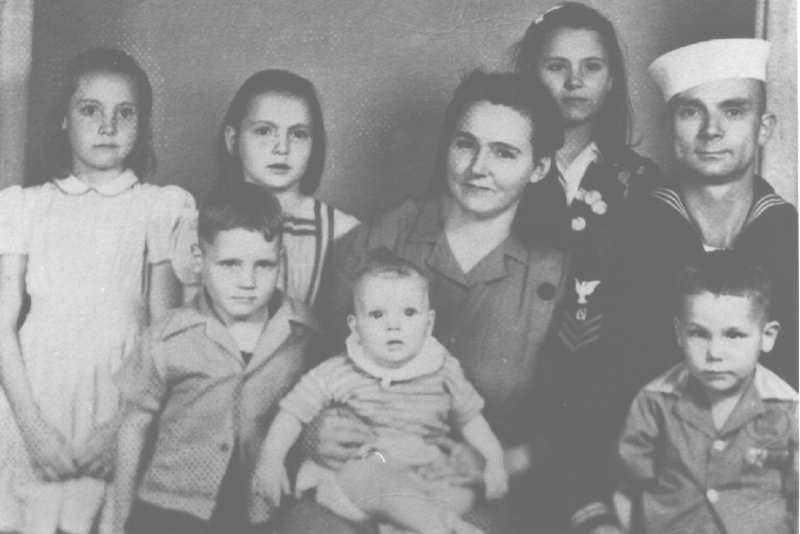 Dot, Carrie, Louise, Virginia, Hoyt N.
Mama came to Florida to visit for a month when we lived in that house. She really loved the beach, and Daddy got permission to take us out on a patrol boat fishing while she was there. We took her home when Daddy got leave. Then Daddy was transferred from Mainside Naval Air Station to one of the training fields, Whiting Field. He was stationed in the boat house or his duty was there. So we started having better food because the boys at the boat house had their lunch sent from Main Side and the cook would send bacon, hams, roasts, fish and etc. for them to take home. We moved from there to Milton, Florida near Whiting Field. Then Daddy got promoted to Boatswains Mate First Class and transferred to Shore Patrol. We sold the house and land in Alabama and lost our extra rations so we sold the 1934 Ford and bought a motorcycle. Hoyt started to school in Milton. Patricia Ann was born in Milton April 25, 1945 at home. I hated the Naval Hospital so bad that I said that I’d have the baby in a field by myself before I’d go back there. We finally found an old doctor, Dr. Turner, who said he’d come to the house. When Pat was one month old, we bought a shot gun house in Bagdad for $400.00. August 20, 1945 the war was over. The European war had ended in April 1945 and after two atomic bombs were dropped on Japan, Japan surrendered. Daddy got his discharge August 25, 1945. We sold the house in Bagdad and moved back to Alabama.